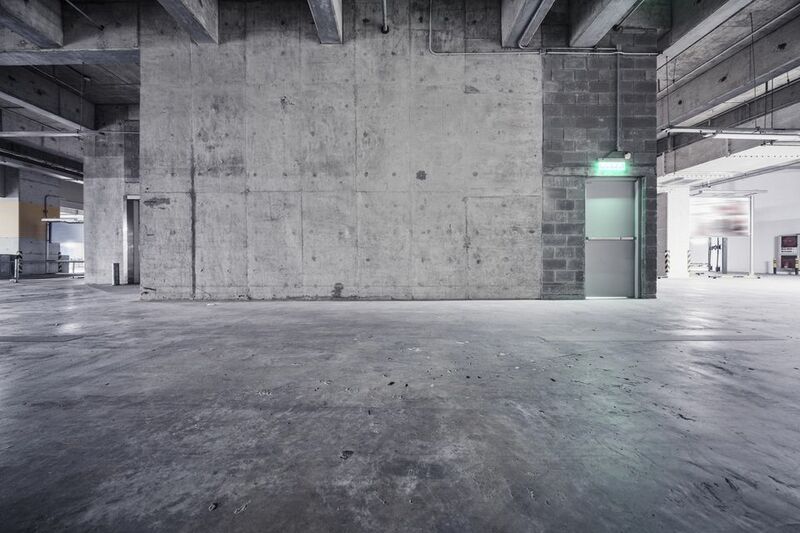 Concrete slabs and floors can be excellent subfloor surfaces for tile and other floor coverings, but too much moisture in the concrete can cause problems with flooring installations. Therefore, it's advisable to have a floor tested for moisture content prior to installing flooring or moisture barriers. There are three standard methods for measuring concrete moisture. Often, more than one method is used to get an accurate reading of actual moisture content. Concrete is manufactured by mixing cement, aggregates (such as sand and gravel), and water. The water creates a chemical reaction in the cement, causing it to harden. The concrete cures, getting harder and harder, while excess water gradually evaporates from the material. Ideally, evaporation is controlled until the initial curing phase has passed, then the excess moisture is allowed to evaporate into the air so that the concrete can fully cure and dry. The curing and drying process that can take days or even weeks. The speed of the evaporation is determined by the temperature and humidity of the surrounding air and can be affected by the size of the pores in the concrete. In any case, as long as the vapor pressure in the slab is greater than that in the air, water will continue to evaporate from it. If excess moisture is present in a concrete slab when an impermeable surface treatment is installed, it will become trapped under that covering. Over time, hydrostatic pressure will force that moisture upwards and can cause bubbles in surface treatments, and cracks in covering materials that are installed above it. A freshly poured slab of concrete releases a lot of water into the air through evaporation. Over time, the vapor pressure in the slab will decrease in relation to the vapor pressure in the air. If the concrete dries to the point where the air is moister than the slab, it is possible for hydration to pass back into the concrete. The ideal time to install a floor surface covering is when the vapor pressures of the concrete and the air are in equilibrium. The plastic sheet method was developed by ASTM International and involves taping a plastic sheet to the surface of the concrete to create a vapor-proof seal around the plastic. The sheet is left in place for 72 hours, then a dewpoint hygrometer is used to test the level of moisture that is in the air under the sheet. This tells you how much evaporation occurred over the course of the 72 hours. Developed by the Subcommittee on Practices of the Committee on Resilient Floor Coverings, the calcium chloride test is similar to the plastic sheet test in that it uses a sealed environment to determine the amount of evaporation that occurs from the concrete floor over a period of time. The test is conducted in three locations for every 1000 square feet of concrete slab. This allows you to determine the moisture level across the entire surface of the floor, rather than just one specific area. For each test site, a packet of very dry calcium hydroxide is poured into a container, which is then weighed. The container is then placed on the concrete surface and it sealed over with a plastic enclosure. After 72 hours the calcium hydroxide containers are removed and weighed again. The excess weight indicates how much moisture the crystals absorbed from evaporation out of the concrete. This information allows you to calculate how many pounds of water vapor are released from every 1000 square feet of space across the surface of the concrete over a 24-hour period. Generally, you do not want vapor emissions to exceed 3 pounds per 1000 feet, although some floor surface coverings will be suitable for environments emitting as much as 5 pounds per 1000 feet. This method involves drilling a hole into a concrete floor and inserting an electronic meter into it, or embedding the meter in the concrete before it has cured. The relative humidity of the concrete is then tested over the course of 72 hours. With this information, the software in the meter is able to determine how much moisture is present through the core of the slab. Surface vapor tests only show you the amount of moisture being released at the surface, while embedded probes only test for moisture within the slab. Both tests are often required to fully determine the level of moisture present in a concrete floor. In addition, it may be necessary to conduct these test several times over the course of weeks, as the condition of the slab can vary over time. You also have to be aware of various elements that can affect the humidity in the air. In a home, heating and cooling systems cause the air to dry out, which can result in the slab showing a false reading. Getting an accurate measure of a concrete slab's humidity level is vital in determining whether you can proceed with surface floor covering treatments.